Art Linkletter reporting from the Danube. Its not often one gets the opportunity to sit down with Terri and just chat for a while. I’m that lucky reporter and today is the day. I caught up with Terri in Melk, Austria aboard a long boat operated by the Viking Cruise Line. Hi, Terri what brings you to Austria? Well as you can guess, this boat. Chuckle. Art, we love taking these trips down the rivers of Europe. You chose a gorgeous day to join us. We enjoy visiting friends on our trips and this just happens to be the home of our friends who are the parents of an exchange student we hosted several years ago. I find trips more exciting when I get to visit friends along the way. Who do you have with you this time or is it just you and your husband? Actually we’ve brought the entire family. It’s so difficult for all our free time to sync, but like magic, here we all are. My only regret is the pups had to stay home. Well I have a dear friend who helps with that, but, when she’s not there with them, it’s the cat. One thing you must promise me Art. Be kind with the cameras. I prefer my thin side to be filmed. And no wide angles. Big smiles and laughter. Of course, but why the concern? You look great. Thanks Art, I have reached my perfect weight after all these years and plan on living a long and vibrant life, living younger than my actual years. And of course I’m ecstatic that I can cover the court like a 17 year old. Well it sure shows. That’s right you are a tennis player. And a pretty decent one at that. How long have you been playing? I practice and work hard at it. It’s my favorite form of exercise and a personal challenge. Every player has a different strategy and shot execution. The trick is figuring out how to beat your opponent’s game while playing your own game without errors. I played a little back in high school and then didn’t pick it up again until my children were in high school. Life and Mom-hood. And actually I used tennis to further my rehab after shoulder surgery and caught the “bug” again. What would you say is your crowning achievement in life so far? I find it difficult to pin it down to just one thing. So may I give you a couple? I have to say my marriage and my children. We have a spiritual foundation and a strong bond. I love the adults, my children have become and am thrilled with the choices they are making for themselves. That’s a hard one — no fair!! Can this one be worth ten points, Art? (Laughter) Two things that I’ve been called by friends, that I like and can have put into print!, are an encourager and renaissance woman. I’ve taken many opportunities and have seen them through to the finish. I’ve been a part of many “first”, that have opened opportunities for others. I enjoy the arts and making things, I sing, I like to drive fast cars, I love animals and spending time with family and friends. It’s been said of me that “I’ve never met a stranger because most people become my friend.” One thing that I’ve been passionate about for a while is helping others reach their highest potential. It’s different in every instance. I began several years ago taking time every day to be still. Still with my physical being and still with my mind. I participated in a wonderful course called Master Key Master Mind Alliance and have benefited every day since it’s completion. Through prayerful request and listening to God, my heart, and the individual, the method to help is always revealed. Sometimes we cannot tell someone what we need or want, but usually we show them unconsciously one way or another. That is why listening to others and your own intuition is so very important. That would have to be my Dad. He is part of the “Greatest Generation”. In fact I’m writing a book about his life story and adventures. I am so blessed that he is my Dad. Now Art I don’t want to cut this short, but I’m sure you’d love to join us ashore for a visit to a chocolatier. You know that priorities are important, and this one will be delightful. Don’t give me that look. We’ll work it off on the courts later. The court is reserve for 3:00. Have your racquet in hand and be ready. And with that my time was gone and so was Terri and troupe. By the way the truffles were out of this world good, and the match was tough. 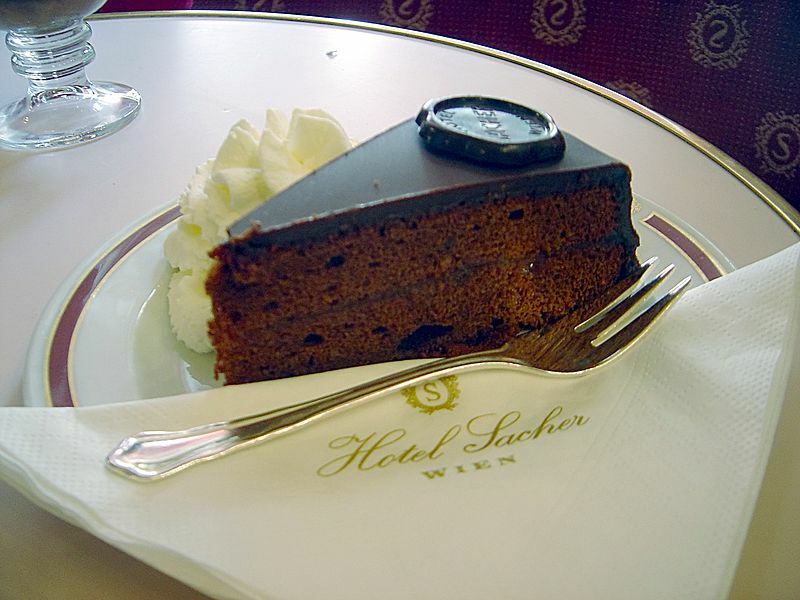 And as a parting gift, Terri gave me the recipe for this cake from the Hotel Sacher. Mm, Mm good.